So yesterday threw me for a loop. I woke up at 3 a.m. with a migraine… that persisted most of the day. Even after taking medication, I felt simply icky. So in fairness to myself, I let day 11 slide. I picked up a pen for some line drawings but honestly, using my eyes hurt. Then I thought… hey! On day 6 I actually finished 2 pieces. That counts for something right?! You betcha! 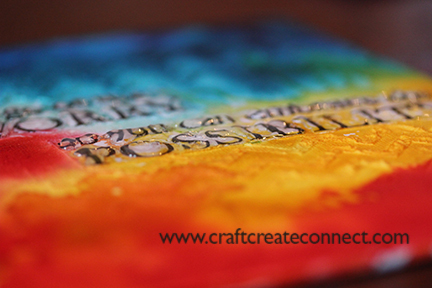 For this piece, I had the idea of trying to figure out what would and would not (as in resist) alcohol ink. I covered a small canvas with gesso and then laid down a quote with gel medium. I stenciled on some fun chevron with modeling paste. When the gel medium over the wording was dried, I covered the letters with hot glue. Then I let the ink do its thing. 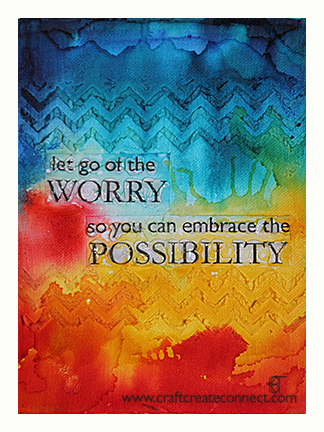 The final piece is not quite how I envisioned, but as my quote says… I am embracing the possibilities! Kim! This is awesome, please put it on your Etsy store, I would like to buy it and send to Hannah at school! Pls let me know when it’s there and I will have you send, k?! Han’s a Gullen girl thru and thru , this quote is a perfect inspiration for my girl!! Yay!! (I am hoping you are willing to give this one up for sale!!!) love it!! This is a lovely piece! Stunning colors and I love the quote…beautiful work.